Once upon a time I became enamored with home design; from a building’s overall architecture–especially mountain lodges, rooms with lots of natural light, and smaller touches, right down to furniture. I would often try to pinpoint what it is about a room that made me consider it a good design. As a young(er) adult, whenever I watched tv it was usually the HGTV channel. I’m still a young adult, but I don’t have much tv watching time these days. Studying home design provided a fix of sorts. By feeding me new ideas it helped me figure out what I do or don’t like for whenever I have the chance and the budget to display my own tastes for items in my own space. One day! 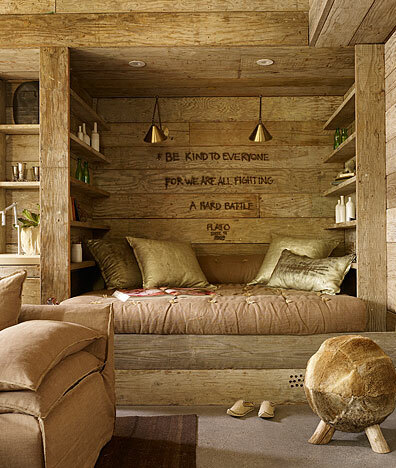 Throw in a nice book to curl up and read and a pair of sterilized tweezers (for the splinters) = dream nook! I’ve enjoyed watching home makeover shows over the years as it gave me a glimpse into how others live but it also made me feel like I was missing out! Growing up, my room style was second-hand by default. I was the second girl, so I had either hand-me-down furnishings or no real choice in anything to do with the room furnishings (curtains, rugs, beds, etc…) because I was a little girl when all that stuff was purchased. I didn’t dislike the furnishings I had but it’s not what I would have picked were I the one buying it. I did have a pretty cool 1930s comic book style Little Orphan Annie bedspread and pillow sham, and a couple of Felix the Cat sheet sets I can remember fondly. I am grateful to have the furniture though, because I don’t really like shopping for big ticket items to purchase for myself. It was never a consideration to give me the choice to style my own living space, mostly because furniture that we already had was well taken care of and there was no reason to get rid of it for no real reason. I eventually stopped caring about home styling and became content with said furnishings and decor. This was around the time (teenager) when a lot of people do start to care about that sort of stuff. For me, it became a non issue as I turned my attention toward other things in my life. The day when I can display my own tastes completely in my living space hasn’t yet come. But I have learned a bit about styles I do like. So, until that day arrives I’ll just enjoy one of my favorite tumblogs through which I can live a highly-designed life vicariously: homedesigning.tumblr.com/. And, of course, there’s always HGTV. This is part 4 of a 5 part series. Check back soon for the final rediscovered obsession. Care to guess what it will be?